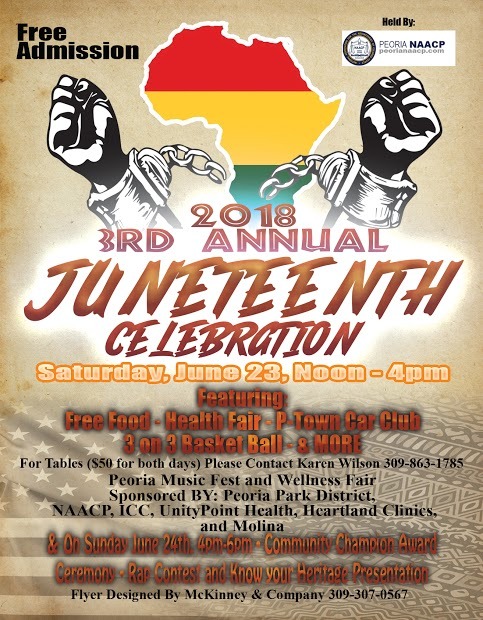 The Peoria NAACP will hold the 3rd Annual Peoria Music Fest and Wellness Fair on June 23rd and 24th at John Gwynn Park and Carver Center. Admission is free and will feature free food, a health fair, 3 on 3 Basketball, and more. On Saturday, June 23rd, 12 – 4pm, the P-Town Car Club and the River City Rough Riders Horse Club will be at John Gwynn. A Health Fair will be held in Carver Center. On Sunday, June 24th, 4pm – 6pm, Heritage Community Champion Awards Ceremony, Rap Contest and Know Your Heritage Presentation will take place at Carver Center. For more information contact Karen Wilson at (309) 863-1785.